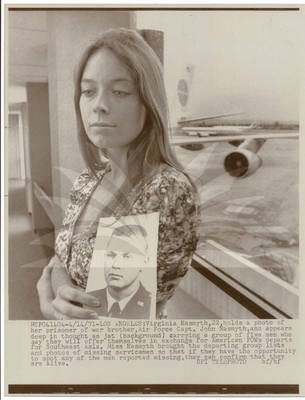 "Virginia Nasmyth, Sister of POW John Nasmyth"
Los Angeles: Virginia Nasmyth, 22, holds a photo of her prisoner of war brother, Air Force Capt. John Nasmyth, and appears deep in thought as jet (background) carrying a group of five men who say they will offer themselves in exchange for American POWs departs for Southeast Asia. Miss Nasmyth brought the departing group lists and photos of missing servicemen so that if they have the opportunity to spot any of the men reported missing, they can confirm that they are alive.